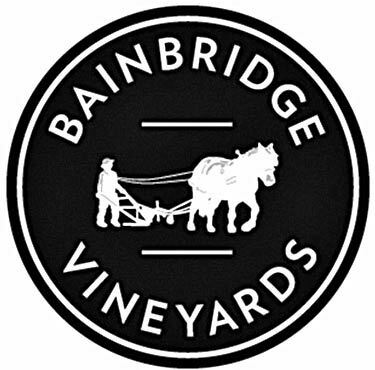 Bainbridge Vineyards is the new name of what was once Gerard and JoAnne Bentryn’s Bainbridge Island Winery and Vineyards, located at the same address. The winery closed in 2009 following the Bentryns’ retirement. The winery reopened in December 2013 under new management, headed by Wittick. Even though technically it is not a cooperative in a legal structure, it is being run like one. 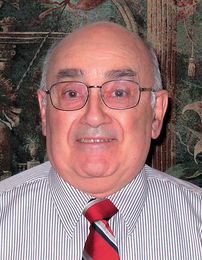 Wittick holds a master’s degree in horticulture from Cornell University and a bachelor of science in plant science from Rutgers University. She began growing grapes and making wine with the Bentryns in 1989. She was working as winemaker in the background for Gerard Bentryn for the past 18 years, so she did most of the winemaking during that time. She eventually took over as winemaker after working under him. 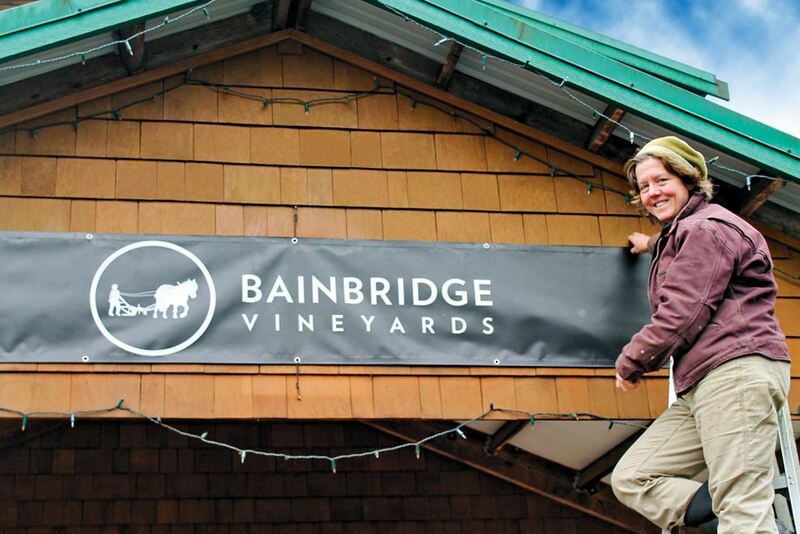 Following the Bentryns’ retirement, Wittick agreed to reopen the winery under new cooperative ownership, using the abbreviated name Bainbridge Vineyards. As winemaker and viticulturist at Bainbridge Vineyards, and also as proprietor of small-scale vegetable operation called Laughing Crow Farm, Wittick is committed to seeing local food production remain a viable livelihood and an important asset to the community. Her enology background comes from her studies at Cornell. While working for the Bentryns, she continued her enology education at Washington State University, the Washington Wine Commission and various seminars from Puget Sound grape growers, and had scientists come from places like Oregon, California and Germany. What she would like to see happen now is to make sure the business will pass on to the next generation by including new, young people who are learning about or have a background or degree in viticulture and enology, or are working with her to get some new ideas and be part of the future. 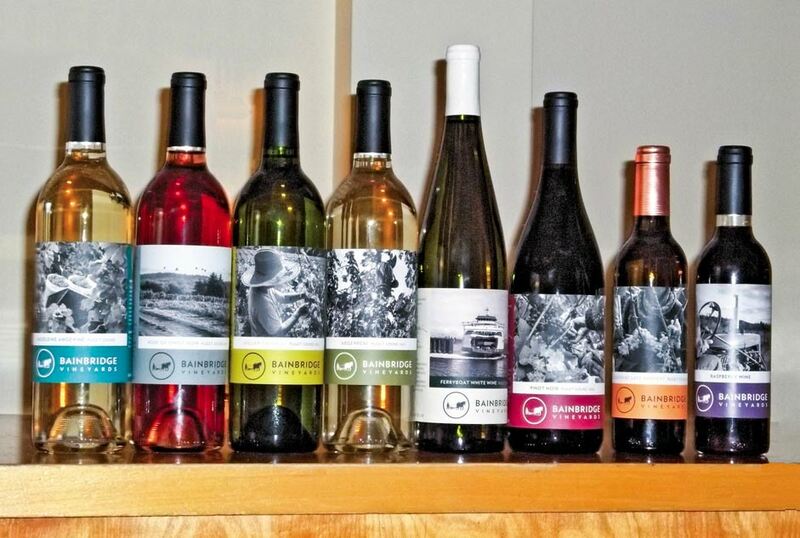 After being approached by a group of young people who had worked as interns at other local farms, Wittick brought together a group that included friends and community members and created Bainbridge Winery LLC. The winery is now run primarily by women but several men do maintenance on the machines. The women have different areas of expertise and work in teams, collaborating in their work and the decision-making. 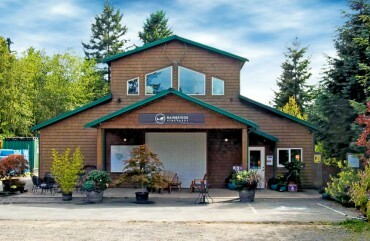 For example, one team runs the tasting room and makes decisions about how it operates. Together, they rebranded the business, which is evident in the bottle labels. 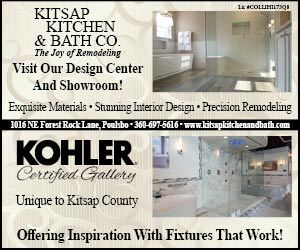 They worked with a designer picked by the team and decided to use photographs by local photographer Joel Sackett, because that would tell the story of the new winery concept a bit better. Sackett took photographs for all the labels. The winery just received organic certification in September 2014, after growing the grapes organically for more than 10 years. Tasting room hours: Saturday & Sunday, noon to 5 p.m.
About eight years ago, Bainbridge Winery obtained new cutting material of grapes from Europe through Washington State University’s Mount Vernon Experiment Station. They also looked at other red wine varieties that can be grown in the Puget Sound region under the shorter, cooler season. Many of the plants have been in the ground for that amount of time and Wittick has been experimenting with what she thinks is doing well here. There are some varieties she will remove and some she will continue to grow. Wittick suggested in the mid-1980s that the Bentryns start producing a red wine because the winery didn’t have any reds at the time. They decided to talk to other producers in Oregon about Pinot Noir and get some plant material from them. 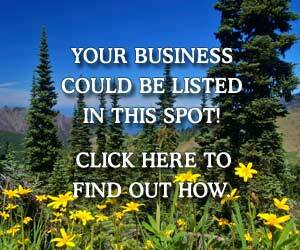 They talked to Barney Watson of Tyee Winery in the Willamette Valley. He was a professor at the time and he helped her get started growing pinot noir on Bainbridge Island. The grapes were planted in the late-’80s and the first commercial harvest was in 1992, although small. Originally from France’s Loir Valley, this dry white wine has citrus and grassy notes with an abundance of fruity fragrance. A perfect match for oysters, white fish and lighter fare. In the traditional French style, this wine is finished dry. Watermelon, strawberry and cherry greet the palate. Finished in an off-dry style, the balance of crisp acidity and slight sweetness in this wine make it a great pairing for rich dishes like pork or those with cream-based sauces. Pronounced “sea-ger-ray-buh,” this delightful grape has the fragrance of muscat and the spice of Gewurztraminer, with notes of melon and grapefruit. Great with spicy curries. A fruity and slightly sweet white wine blend of Madeline Angevine, Pinot Gris, Siegerrebe and Muller Thurgau. The perfect picnic wine. A medium-bodied, red-crafted in the style of the French burgundies. Dry, with notes of cherry, plum, tobacco and oak. Lovely when paired with lamb or grilled salmon. Made in the style of the French Sauternes wines. The raisined, botrytis-affected grapes result in a dessert wine rich with honey, apricot and tropical fruit flavors. With over one pound of organically grown Bainbridge Island berries in each bottle, drinking this dessert wine is like enjoying a mouthful of fresh summer berries with each mouthful. 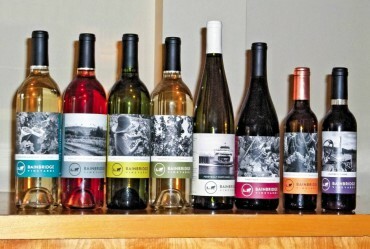 Bainbridge Winery wines are sold at Bainbridge Island’s Farmers Market, Town and Country Market, Bay Hay and Feed on the island; Albertsons and Central Market in Poulsbo; Port Townsend’s Co-Op; the Corner Farm Store in Chimacum; Nash’s Farm store in Sequim and Natches Farm Store in Trent. Wittick loves the idea of having a truly local meal with local wine, and having the ingredients come from local farmers. Over the last 10 years, there has been a diversity in local food. More people are now raising chickens, pigs and cows in the Puget Sound region. 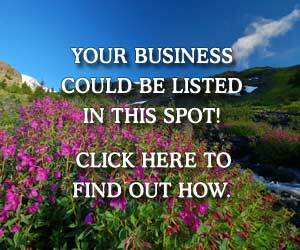 There is also an increase in shellfish and other seafood like salmon, oysters, etc. and in small-scale dairies making cheeses. 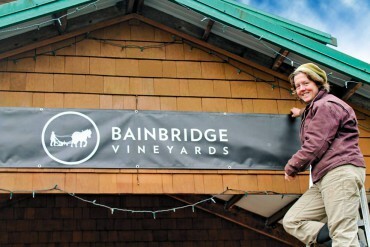 Ms. Robin Bodong is one of the new, young people Wittick attracted to Bainbridge Winery. Bodong, who is originally from Bainbridge Island and now lives a few miles from the winery in Indianola, took over as vineyard manager. She received her undergraduate degree from Sarah Lawrence College in New York and studied horticulture plant science. “We help each other out by sharing responsibilities in a lot of the business of the winery,” she said.